Dinner for Super Bowl Sunday was all about building the perfect nachos. It's so much fun to watch kids decorate and construct the perfect blend of toppings and then they get to eat it! 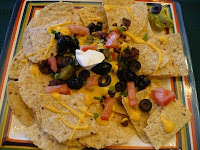 After heating some nacho cheese in the crock pot, and making a quick batch of taco ground beef, we had bowls of guacamole, green onions, black olives, tomatoes and sour cream ready to go.